As part of our initiative ‘WeddingSutra on Location’, we invited four brides-to-be for a unique experience at Tarun Tahiliani’s couture studio in Colaba, Mumbai. Starting with a Style Consultation, a Makeover and a Photo shoot, each of the participants got to interact with some of the best names in Bridal & Wedding services. 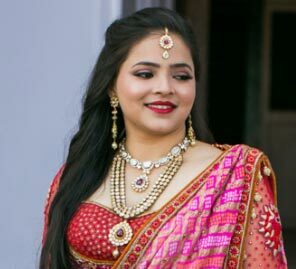 Here in the second of the four-part series, bride-to-be Disha Shah, tells us about her experience with WeddingSutra on Location. 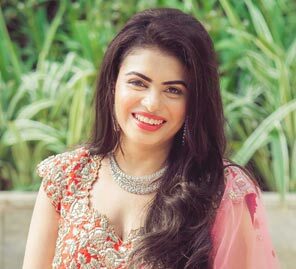 “I am getting married in a month from now, and my destination wedding is in Krabi, Thailand so when my Wedding Planner Neha Shroff recommended my name for WeddingSutra on Location, I was quite happy and excited. 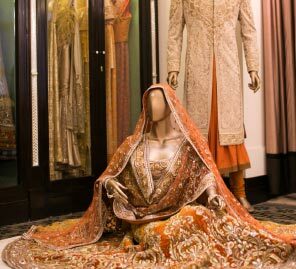 When I was informed it is at Tarun Tahiliani’s Studio I was happier– it is always a pleasure to visit his store and take a dekko at his rich creations. When I walked into Tarun Tahiliani’s ‘drawing room’ style studio I felt quite relieved within a few minutes of being there– everyone there seemed very friendly and chatty, and that is the environment I am more comfortable in. My session started with an interaction with Stylist Neha Kundnani who suggested I try a dress which I liked at first sight- a voluminous net dress, fitted at the top with an asymmetric patterned outer jacket. We then looked at the different traditional gold jewellery options from Azva. Nisha recommended a layered statement neck piece set and some bangles to complement, so overall the look seemed nice. With my outfit and jewellery sorted, it was time to get a makeover by Ojas Rajani. For someone as restless as me, I was nervous about spending a considerable time doing my hair and make-up, where I could do nothing but just sit still. It seemed like a tedious, herculean task to overcome. But to my great joy, everyone around engaged me in conversation. I asked a lot of questions, as did the other brides-to-be and time flew by. Before I knew it, Ojas gave me the perfect bridal makeover, transforming me into a glamorous bride-to-be!